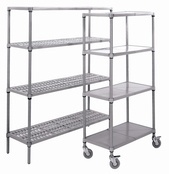 Heavy Duty Steel Plastic Coated Shelving. Combines the corrosion resistant qualities of plasic with the strength of steel. The shelf panels are guaranteed for life against corrosion.